Last night the NFL released it’s 2015 Regular Season schedule. Oakland’s schedule includes seven games against 2014 playoff teams and 11 games against teams with winning records last year. Aside from AFC West Divisional opponents, the Raiders will have some tough match-ups against teams from the AFC North and the NFC North. 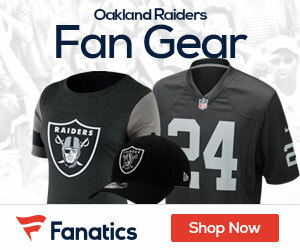 Oakland will also see non-divisional match-ups against the New York Jets and the Tennessee Titans. First year HC Jack DelRio will start the Raider’s 56th Season at home, against the Cincinnati Bengals on Sunday Sept 13th. One interesting note (as I am from Cleveland) is that since the Browns returned to the NFL in 1999, Oakland and Cleveland have played each other 9 times, with Cleveland beating the Raiders 6 of those 9 times. Of Course I will be decked out in full Raider regalia on Sunday Sept 27, 2015 as the Raiders return to Cleveland for the second year in a row to face the Browns..
Oakland has only one Prime-Time game this year, which may or may not have Divisional/Play-Off implications when they face rivals San Diego Chargers on Christmas Eve, Dec 24th for an 8:25pm start on the NFL Network. Sunday, Aug. 30 ARIZONA CARDINALS 8:00 p.m.
Sunday, Sep. 27 at Cleveland Browns 1:00 p.m.
Stay tuned to WWW.RAIDERSGAB.COM for more Raiders news ! !